This website is based on the Confident Body, Confident Child resource pack, which has been developed by researchers in the EMBodIED Research Team from the School of Psychology and Public Health at La Trobe University, Melbourne, including: Dr Stephanie Damiano, Dr Laura Hart, Chelsea Cornell, Fiona Sutherland, and Professor Susan Paxton. Please click here to find out more about the development and evaluation of the resource. 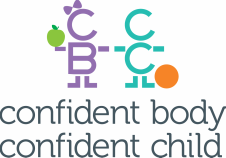 The Confident Body, Confident Child resource pack includes this website, the Parent Book, activities, fact sheets, the Extended Family Book, and a poster to assist parents with promoting positive body image and healthy eating patterns in their young children. This website includes all the information, parent tips, and activities presented in the Parent Book, as well as some of the activities that are only available online, the fact sheets, and access to videos for parents. You will also find a page presenting the 'Extended Family Book', as well as a 'Further Information' page that lists some other books you might like to read with your child, some other interesting online articles and videos, and some of the key references the research team used to develop Confident Body Confident Child. SO WH﻿AT DO I SAY WHEN...?